You are here: Home / Types of Tea / Green Tea / Lipton Mandarin Orange Green Tea: Excellent! Green tea is a personal favorite of mine. Given the fact that it’s a disease fighting ninja – I wish it were a favorite with everyone. My oldest daughter (Emily, aka, the Crazy Tea Chick, herself) is also a green tea fanatic and my husband will drink it if it’s cold (picky pockets). My youngest daughter, Stephany, only likes Matcha Green Tea (prissy diva). The rest of the family shuns green tea the way I shun liver. Well, maybe not to that extent. If more people would give it a try, they’d realize that green tea is the elixir of the gods – especially with a little honey or fruity flavor. 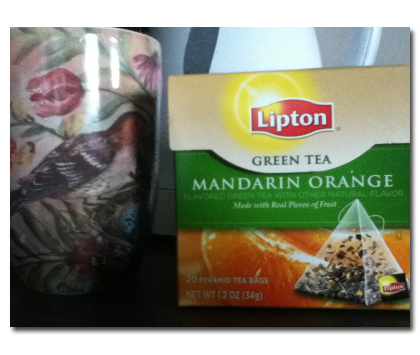 Lipton’s Mandarin Orange Green Tea (shown above) is outstanding. I would have shared it with the members of my family but… well… I drank it all. I guess it goes without saying that this tea is exceptional, but I’ll go ahead and say it anyway. It’s exceptional. Whether you already love green tea or are warming up to it, you’ll love Lipton’s Mandarin Orange Green Tea. The orange flavoring is just perfect – it isn’t overwhelming but you get that distinct and delicious mandarin flavor. I drink it throughout the day (yes, all three of them). In the evening, I like a couple of hot mugs of tea while watching baseball with my husband. During the day, while working at home as a web publisher, I prefer my green tea on ice. When feeling particularly feisty (usually on Mondays, Wednesdays, and Fridays – my feisty days), I”ll float an orange wedge in the glass. This morning, I added a little mint from my herb garden. Lovely. The beautiful mug in the picture above was given to me recently from Stephany (the prissy little diva) and her boyfriend Rusty (neither prissy or a diva). They picked it up for me at TJ Maxx and brought it home to me as a surprise. Yay, surprises! The mug is gorgeous – very thick and heavy and obviously very well-made. Love it. I happened to notice, recently, that TJ Maxx carries some gorgeous mugs as well as a large selection of tea. TJ Maxx is more than just clothes and handbags… oh, but don’t even get me started on their handbags! Previous Post: « Olive Garden’s Peach-Raspberry Iced Tea: Heavenly!